You have been waiting all week for your paycheck, 401K check, insurance check, or tax check and today is finally the day you get it. The mail has arrived and you now have your check. That was the easy part; you go to the bank to cash the check, and they want to put a 5-10 day “hold” on your check even though it is your money. We know what it is like to stand in line for 30 minutes only to be told “no”. Or the only place that says: “yes we can” requires a couple of hours and also wants to charge you a fee twice that of the other places, that have told you “no”. We believe that you have worked hard and have earned your money, whether it is your paycheck, insurance check, tax check etc. We come from the belief that every check is good until proven otherwise. We will be upfront and honest in what we need from you in order to cash your check. We can cash almost all checks in a matter of minutes. We provide adequate staffing so you don’t have to wait in line for an hour just to get your hard earned money. You bring us your paycheck, insurance check, tax refund check, etc and a current state issued photo I.D. and fill out an incredibly quick and easy application that takes less than a minute to fill out. 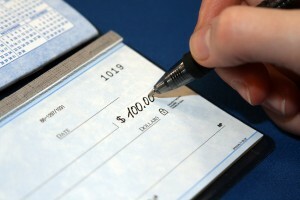 We do a very simple and quick verification and then “cash” your check for you and provide you cash on the spot. You are in and out in a matter of minutes. Your check that you would like for us to cash.